A diagram of the TailFan, a demonstrator aircraft under development at NASA's Langley Research Center in Hampton, Virginia as part of the Personal Air Vehicle Exploration (PAVE) program. Ask science fiction fans about the future and no doubt they'll tell you it's full of flying cars. The concept of personal flying machines seems to be as old as the aviation itself, yet cars, trucks and buses still claim the transportation throne. However NASA researchers, as well as private aviation engineers, are working to develop the next step in personal air transportation. The Personal Air Vehicle Exploration (PAVE) program at NASA's Langley Research Center in Hampton Virginia, for example, is working to develop easy-to-use aircraft that may one day take you from your garage to the airport and on to your destination, saving time - and hopefully dollars - otherwise be spent on a public flight. "That's always been the dream," said Andrew Hahn, PAVE vehicle sector analyst at Langley, of flying cars. "Our plan is to have a flying demonstrator by ." While Hahn and PAVE manager Mark Moore work to develop roadable air vehicles, other Langley researchers in a separate project are hoping to streamline the interfaces between personal aircraft and the thousands of small airports across the country to serve future flyers. The challenge of fusing cars with airplanes is that, in the end, the final vehicle tends to be inefficient on the road and in the air. "It was heavier and costlier and not a particularly good car or airplane," Hahn said of the vehicular combination. "So at least with the foreseeable technology, it didn't look too attractive." Meeting Department of Transportation regulations for road vehicles, he told SPACE.com, also adds a 1,000 pounds of weight to a vehicle. PAVE is aimed at developing a small aircraft capable of short jaunts on city streets, enough to get to a nearby airport and back, researchers said. The first step is a demonstrator aircraft, called TailFan and expected to fly by the 2009 fiscal year, to tackle some of the biggest challenges to personal air vehicles. Among them are ease-of-use, environmental issues like noise and pollution, as well as affordability. "Airplanes are just not affordable to the bulk of people," Hahn said. "And those who can afford them aren't buying them in droves." For TailFan, PAVE researchers are taking a horse-like approach to navigation, building a system smart enough know where to fly but allowing human aviators enough control to stay attentive in case of an emergency. "It's sort of like this interesting middle ground...like having a robotic copilot," Hahn said. "Full autonomy is not going to be reliable enough for people to trust their lives to." A roadable vehicle like the Gridlock Commuter is still about 10 years away, he added. Another, potentially nearer-term flight alternative is also under study by LARC researchers. Dubbed the Small Aircraft Transportation System (SATS) program, the project is developing some of the basic technologies to make use of the more than 5,000 small airports across as a greater means of point-to-point transport. "Nearly all of the people in this country live in a 30 minutes of a small airport," said Jerry Hefner, SATS project manager at Langley, in a telephone interview. "We're working to move general aviation and small aircraft from enthusiasts to a mode of transportation." SATS is primarily aimed at boosting volume operations at small airports without towers or radar, as well developing new technologies and operating procedures to help pilots land in low-visibility at minimally equipped airports. Increasing single-pilot crew safety, with systems such as synthetic vision, heads-up displays, and integrating those small aircraft into the larger national airspace are also project goals. "The idea is that you won't have to leave home an hour early to get to the airport, then spend two hours waiting for security and check-in," Hefner said." Developing that navigation and airport infrastructure is a vital component for the future of personal air travel, according to aircraft developers. "Without it, the vehicle will be primarily a novelty," said Paul Moller, an aeronautical engineer spearheading development of the Skycar vertical takeoff and landing aircraft at Moller International in Davis, California. "A highway in the sky is a really critical tool." SATS researchers are planning a flight demonstration of their technologies in 2005 at Danville Regional Airport in Danville, Virginia. The effort is a joint project with the Federal Aviation Administration (FAA), U.S. Department of Transportation and the National Consortium for Aviation Mobility. The U.S. government has only approved two vehicles that could both drive on city streets and take to the air. The first was Airphibian, a 150-horsepower vehicle with detachable tail and wings that could be removed for street driving. Developed by Robert Fulton in 1946 and approved by the FAA's precursor - the Civil Aeronautics Administration. Moulton Taylor's Aerocar, with a body covered in fiberglass, also gained FAA certification and could fly at 120 miles (194 kilometers) per hour. While both vehicles were flyable, they failed to find enough support to get off the ground commercially. Hahn even doubts the true roadability of both vehicles. "The Airphibian is a three-wheeled concept - only needs to meet motorcycle regulations - which did work, but I doubt was fully roadable [at] 65 mph on a highway for hours on end," he said. "The Taylor Aerocar is fully roadable, but is not compliant with the [Department of Transportation's] regulations for cars." Many researchers and engineers see robust personal air transportation as an inevitable alternative to congested airport hubs and freeways frozen by traffic. "People are going to stop driving if they can't get anywhere," Moller told SPACE.com. 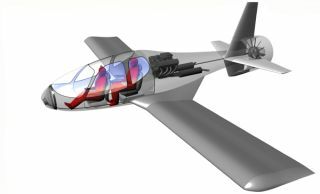 In addition to Moller's Skycar, a number of private groups are pursuing their own versions of a personal flying machine. Engineers at Israel's Urban Aeronautics Ltd. are developing an aerial utility vehicle dubbed X-Hawk while Hunstville, Alabama's MACRO Industries are hard at work on the SkyRider X2R. If those vehicles catch on, Hahn said, they could even drive a wedge between rural and urban lifestyles, with people living on small airports and flying to their urban workplace a hundred miles away or more. Many people already live in airport communities where aircraft taxiways start at the end of their driveways. In Florida's Spruce Creek community just south of Daytona Beach, for example, 4,500 people and 600 aircraft live in close quarters, with 1,500 people parked off nearby taxiways. "There's just a lot of advantages to it," said Peter Rouse, Spruce Creek's airport manager and a longtime resident. "And it's a pleasant place to be, that's the main thing."